Synthetic peptide (the amino acid sequence is considered to be commercially sensitive) within Human ATPB aa 450 to the C-terminus (Cysteine residue). The exact sequence is proprietary. Our Abpromise guarantee covers the use of ab170948 in the following tested applications. WB Use at an assay dependent concentration. Predicted molecular weight: 56 kDa. Mitochondrial membrane ATP synthase (F(1)F(0) ATP synthase or Complex V) produces ATP from ADP in the presence of a proton gradient across the membrane which is generated by electron transport complexes of the respiratory chain. F-type ATPases consist of two structural domains, F(1) - containing the extramembraneous catalytic core, and F(0) - containing the membrane proton channel, linked together by a central stalk and a peripheral stalk. During catalysis, ATP synthesis in the catalytic domain of F(1) is coupled via a rotary mechanism of the central stalk subunits to proton translocation. Subunits alpha and beta form the catalytic core in F(1). Rotation of the central stalk against the surrounding alpha(3)beta(3) subunits leads to hydrolysis of ATP in three separate catalytic sites on the beta subunits. Belongs to the ATPase alpha/beta chains family. Mitochondrion. Mitochondrion inner membrane. Peripheral membrane protein. 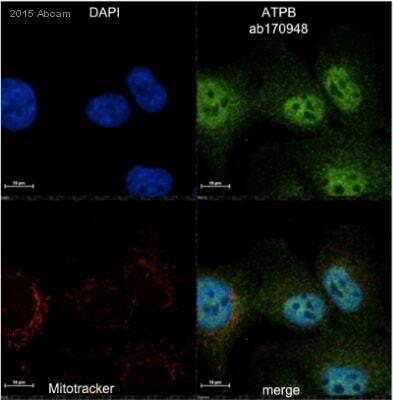 Flow cytometric analysis of permeabilized 293 cells labeling ATP5B using ab170948 at 1/10 dilution (red) or a rabbit IgG negative (green). HRP-conjugated anti-rabbit IgG preferentially detecting the non-reduced form of rabbit IgG. ab170948 has not yet been referenced specifically in any publications. Publishing research using ab170948? Please let us know so that we can cite the reference in this datasheet.